Google to pay $500m online drug advertising fine — Google gets fined half a billion dollars “for publishing online adverts from Canadian pharmacies selling illegal drugs to US customers.” The question that nobody is asking is: Why is this a crime? It’s a crime because US Pharmaceutical companies don’t want US citizens from buying their drugs cheaper elsewhere, and have bribed our representatives into passing special laws to make it illegal to do so. Corporations produce their products wherever is cheapest. Customers should be allowed to buy stuff wherever they want for the same reason, without “sweetheart legislation”. In my opinion, the “counterfeit” claim is just a smokescreen. So much for the free market. Moral: Headlines can be misleading. Well, I finally got my fare booked (with Continental, for anyone who is interested), and noticed something rather interesting in the final confirmation. That’s right, folks, the fees and charges cost more than the fare! 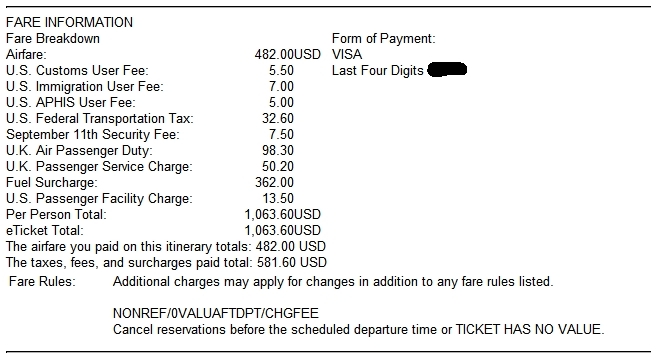 Most cynical, however, was the airline’s sneaking in a $362 “Fuel Surcharge”. Given that they contract-price their fuel at least six months in advance (and the price of crude is falling) fuel prices should never be a surprise and fees like this should never be acceptable. The honest thing to do would be to simply include it in the price. Sadly, it appears that the honest thing may too much to expect from some Airlines. So why do they do this? Simple. False Advertising. They hook you with a low fee and then tack on the surcharge at the end hoping that you don’t know, don’t care, or are too damned tired to look elsewhere. Is this illegal? No. Should it be illegal? I don’t believe that it should or can be; all the laws in the world won’t make a dishonest person honest. What works is when people turn and walk away. The total fare is the only thing that matters. For me that was not unreasonable, and I do not feel ripped off. But I wish they would just include it in the fare. Next time, however, I will be flying with a different airline. But that is another story. 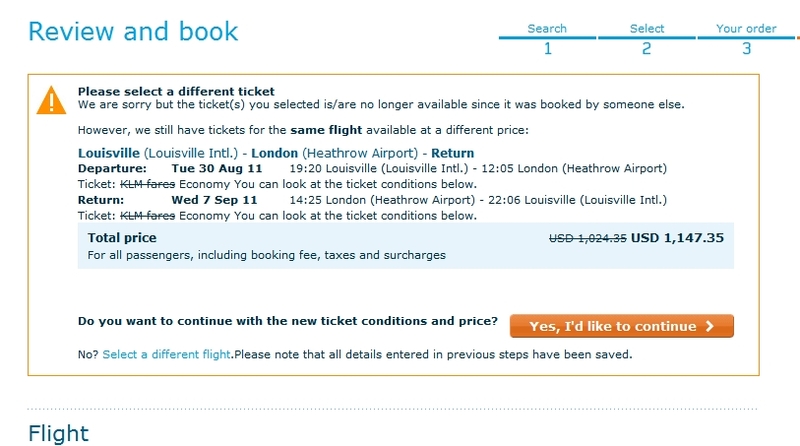 I was booking a flight to London (that’s “London, England” if you failed Geography). 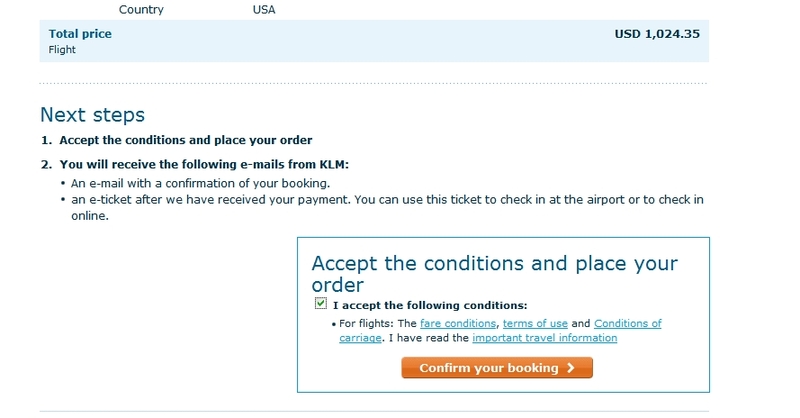 KLM were offering a decent fare, and have an excellent reputation. The website is perhaps the best I’ve seen; the “three-day matrix” is a brilliant piece of design. After filling in all the necessary information I finally ended up here. After checking the box and confirming the booking I was rather surprised to get this. That’s right, folks… the price had gone up by $123. I tried again, same result. I refreshed the browser and started again, same result. I tried again with different flights, same result. I tried again with a different browser… same result. I tried calling KLM’s Customer Service. They put me through to the web team. We were cut off after ten seconds. I didn’t bother after that. So.. I’ll send a link to their Customer Service Dept and we’ll see what they have to say about this, if anything. Methinks KLM have some explaining to do.